What I've been up to: electrifying my ride | Watts Up With That? Some regular readers may have noticed that I’ve been a bit detached from the blog in the past week. There’s a good reason for that. I’ve been immersing myself in the joys of owning and learning about the nuts and volts of an electric car. It would be interesting to see what some other pro-AGW folks drive. I see Jim Hansen has a 85 mile each way commute from his house in Kintnersville, Pennsylvania to Columbia University in NYC. If you are a Ford pickup truck owner, you’ll recognize the logo. 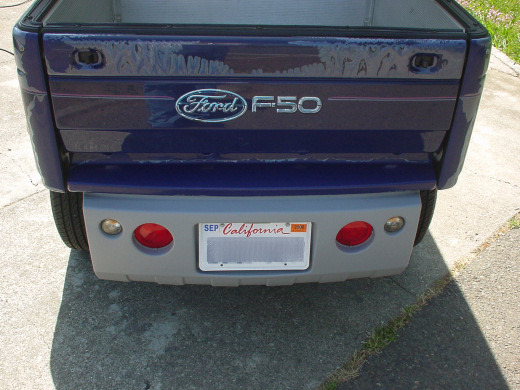 The famous Ford F-150 pickup truck is rated for a 1500 pound cargo capacity. This vehicle is rated at 500 pounds, hence the designation, though not an official one. “Fix Or Repair Daily”, or “Found On Road Dead”. Though not really, I get about 25-30 miles of range from this vehicle, and finding a power plug is easy between my home, office, and some folks around town I know. 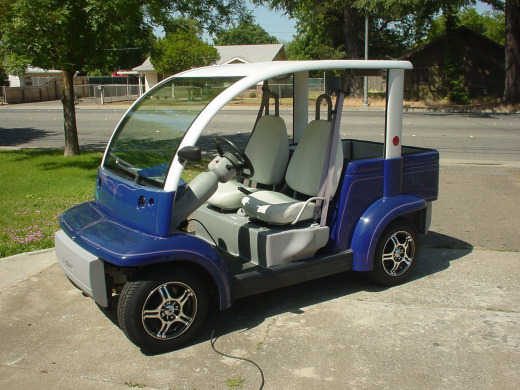 Currently it has a top speed of 25MPH, which is limited by a controller, but the vehicle can be modded with new programming and an enhanced efficiency motor to reach up to 39MPH. I’m not sure if I need that, as I have not found the speed to be an issue. I mostly take the back streets anyway, and my office is about 2 miles from my home. The only place I can’t go is the Highway, but I don’t need to. The complete vehicle specs are listed here, from testing done by the US Department of Energy. In California, I pay about 15 cents per kilowatt/hour, so my cost would be: $.024/mile or 2.4 cents per mile. With battery replacement every 4 years, I figure that will rise to 3, maybe 4 cents a mile. Even if I’m off by a factor of 100%, and it costs me 6-8 cents a mile to drive, it is still a bargain. In my regular vehicle, given the $3.89/gallon gas price, I figured I was spending about $40-$50 per week in gasoline costs just doing my daily routine and errands. So, my mission here is simple; I’m not saving the planet, I’m saving money. That is infectious, and my local newspaper editor, David Little, did his weekly Sunday column on it and the electric car club in town. He’s hooked. In the meantime, I’m having a ball! Bumper sticker suggestions are welcome. The links on your web page are gone. REPLY: What links on what page? I don’t see any issues. Okay, it’s cool in a geeky kind of way, but with only 2 miles to commute, a bicycle isn’t a better deal? Yeah, the seats are better, you can take a passenger and some cargo, and the windshield will keep the bugs out of your teeth. Still a bicycle will be cheaper. REPLY: I have a bike, but I often make trips to get parts for various projects my business does. Last week I was hauling several pieces of steel tubing (about 75lbs worth) in the bed of this vehicle. Can’t do that on a bicycle. A bike just isn’t practical for me given the number of business errands I run for parts locally. Otherwise, yes I’d ride my bike. I keep saying those words *exactly* to by TBF (true-believing friends), and it goes right over their head. They just cannot understand why people aren’t lining up for 10kW solar systems, windmills and electric cars. I keep saying that when they are cheaper than buying power from Duke Energy, or can go more than 100 miles on a charge and not need 8 hours for a full re-charge, you’ll see me at the head of the line. I could invent a device that turns dog turds into pure energy, but if it costs $100K, no one except Ed Begley Jr would buy one. It’s about the money. Period. I could sure use an idea on how best to go about using solar power in our school. Specifically I need to cool a room with lots of computers in a climate that is not arid. Fortunately hot days are often sunny. I am also a “wallet green” – 7.5 kv array for my all electric home in Southern Claifornia. It came down to saving money when i remodelled it – SDG&E charges criminal rates, and the place was all electric. Piping in gas would have cost the same as the PV after taxes and rebates. No brainer. When people come over they assume my motivation is political, and you get all sorts of interesting comments. The die hard AGW believers feel the need to tell you what they are doing to reduce their footprint. They just oooooze guilt at not having invested in PV Solar (but can tell you about their amazing jet-fueled vacations). Then I tell them about the debate not really being over, refer them to your site and icecap, and show them that the politicising of “science” is headquartered at the IPCC. It is fun to watch what happens afterward! This is very neat looking and I’d love to drive it but it wouldn’t work very many days of the year around here… I at least need a closed cab. Still, I love the Ford 50.. I drive about 15 miles per week (15 is the average, a typical week is about 5), get about 22/30 MPG (city/highway; didn’t actually calulate it, from fueleconomy.gov), and walk to work. I refuel about once every 3 months. Writing as usual from 41 and change north, 96 and change west, I wonder how one would work out here in a couple of months. Hmmmm….in dry, warm (it _has_ happened, warm. I clearly remember it) weather it is 25 miles to lots of places I have to go. An way, I forget. does it snow in Chico? REPLY: It snows on average once every 5-8 years. Typically it is a one-day event that doesn’t accumulate. I have weather doors for it. It is certainly more economical than my 1970 Bronco and probably less bumpy a ride. But…I’ll stick with the Bronco. REPLY: The Bronco does a better job with hills where you live. While you may be saving money, you are not saving energy. An electric car has an energy efficiency of around 12%, about a third of a petrol car of equivalent size. People normally dispute the battery charge/discharge efficiency so here is a reference. REPLY: Good point. But when you charge the vehicle from a solar array, you don’t have the transport/efficiency issues to worry about. I’m putting a small solar charger on the roof of the vehicle so that I won’t have to plug it in at my office. While it won’t do a complete charge, it will help. Well, like atmoz I don’t drive all that much. I fill up about once a month. But there are definitely times I’d prefer more than 8 or 9 mpg. Biz travel keeps my Carbon footprint high though. Last week Kansas City, this week Vancouver, next week Phoenix. It would be interesting to see an ROI done on your solar panels. REPLY: Oh I know the numbers, neither my home or school project would be economically viable without a rebate from the State of California. The cost per KW is quite high. My comment doesn’t make much sense after the post was minorly edited, and can probably be deleted as it’s now decidedly off-topic. Also, I’m not sure if it was intentional or not, but the link in your blogroll to “Atmoz” points to the Atomz site search. REPLY: I thought I’d broaden the topic a bit, so I expanded beyond just bloggers, thus I’ll leave your comment – unless you were trying to say that you are not pro-AGW? 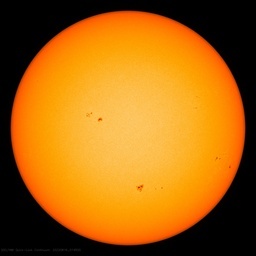 I added (AccuWeather) and updated the blogroll links this weekend. Yours got deleted accidentally when I was editing and I put it back right away, but must have simply typed it wrong when I put it back. Atmoz and Atomz – fixed now. My sincere apology for my Atomic dyslexia. I’m sure you get that a lot. I’d love to go solar here on Whidbey Island, about 50 miles NW of Seattle. But fear it wouldn’t work well with the huge number of overcast days we get, and the low sun angle up north here. I’d also love an all-electric car for commuting. But I live in an apartment during the week, closer to Seattle, and have nowhere to plug it in. That’s one of the major disadvantages to plug-in electric. It’s going to automatically exclude anyone without an exterior plug (apartments, condos). Some major infrastructure needs to be implemented. Such as plugs at parking spots, maybe with a security PIN so it won’t turn on unless the right PIN is entered. And it would need to turn off as soon as unplugged so someone couldn’t come along and unplug your car just to plug theirs in for a free charge. As it stands, my 35 mpg Matrix does a very good job, and has plenty of cargo space (I keep my bicycle in the back). Speaking as a member of the nuclear power industry, I must say that I am very very happy to see electric vehicles. The more the better. Keep pushing the industry to develop better batteries and better motors. If a couple 100 thousand people bought vehicles like this, maybe the industry would see them as a good place for some big research bucks. I live about 5 km from the office. One of these would be practical for about 8 months of the year when there was no snow or slush. The rest of the year it would be tucked away in the garage. There’s ‘economically viable’ when you compare to the rates for grid power – then there’s ‘economically viable’ when compared to miles in your vehicle. En espanol …. F.O.R.D … Fabricado Ordinado para Repario Diario (trans. – fabricated for daily repair). I would love to have something like that to play with. My sincere apology for my Atomic dyslexia. I’m sure you get that a lot. I didn’t think it was intentional. If I did, I assume you would have just deleted it. That’s why I mentioned it here. REPLY: Well it’s your site, its matter of what professional standards you want your blog to aspire to. In my case I read/moderate every comment, and in some cases where comments are really OT or ad hom that is really personal, I simply press the “delete” link as opposed to the “approve” in the WordPress comment form. I find that the time is identical to do either. Man oh man Anthony, that’s about the ugliest golf cart I’ve ever seen. If you decide to go into production make sure the northern New England edition has 18″ balloon tires, and a Briggs & Stratton auxiliary engine for cold weather starts. Should be in a yellow diamond shaped sign. REPLY: “Driver emits CO2” with one of those hazmat stickers might work also. I guess I’m going the opposite way. With gas here in the Hearland going to $4 a gallon, I’m close to getting a used Ford Excursion. All of a sudden they are on lots everywhere, the prices are falling fast! REPLY: Your bumper sticker could read “Giant Sucking Sound”. very nice. I’ve seen a couple of Smart Cars, which look very similar to yours, riding around my city here in central Pennsylvania. you should also put thato n your bumper sticker: I’m not saving the planet, I’m saving money. far more people respond to the “wanna save some bucks” rhetoric then the “you must do this or we all die!” rhetoric. I scanned through the above talented notes and hope I don’t plagiarize anyone. First you should send your good governator a thank you for not taxing your ‘fuel’ for road use. Also you should make note of your savings on tune-ups and oil changes and just think, no radiator to leak antifreeze on your driveway to poison your neighbors dog. about 50-60 kilograms in there. Don’t get in an accident in a golf cart. We have plenty of them around here, the results are not pleasant. They won’t let the golf carts drive on the sidewalk, so you are on your own. Here is something to think about — I have a friend who was driving down the few miles to get an ice cream one evening, he and the wife on board. Along comes a big car, driver loses control, hops the medium, headons his car — Been limping ever since, can no longer work, back surgery helped a little, his wife is in constant pain after hip replacement, she eats pain killer pills like popcorn. Sorry, not gonna do that for no amount of money. REPLY: I hear you, the same would be true if a rode a bycycle. The key is alert and defensive driving, and using side streets (which I do) rather than the main thoroghfares. If you like electric cars the Tesla is pretty spiffy. Unfortunately the price tag, > $100k, is also pretty spiffy. I’m hoping that once they develop the technology they can produce a more reasonably priced car that the average person can afford. They have a version 3D2 battery in the works that will be much better yet. I hope to get a small older car that has a blown engine and a manual transmission, and convert it. Unfortunately the conversion cost looks to be about $10k. Completely off-topic, but the F50 and various slogans made me think of it…..
Years ago, when I lived in the Toronto area, I knew a fair few people that worked for the Ford plant in Oakville. In the same vein, the Litton workers used the phrase “Litton – we put a little cruise into everything we build”, since they were manufacturing cruise missile parts at the time. Hehe. Post or not, as you see fit….just thought you might enjoy the comment personally. I know this is OT…. but Arizonans sound pretty smart…. I confess that I tried onece to buy a Citicar (Citivan, actually). Wife pointed out correctly that we would be able to buy batteries for it if we did. What’s the crash rating if broadsided by a real F150? REPLY: I thought about that long before and it is the same as riding a bycycle on city streets. The key is defensive driving. and remember, that if you are in Barcelona or San Sebastián, you must say “castellano” not español!!!! Not much comfort when the other guy is drunk or distracted on his cell phone. I have been broadsided by a drunk driving old 89 Olds. I caught his lights out of the corner of my eye as he ran the red light at the intersection I was just entering. It was only the power of my V-8 Mustang that saved me as I gunned it and took the hit in the rear panel instead of the driver door which would have killed me. I have always driven a full sized, 4 door, V8 since. When my real estate agent friends complain about the current price of gas I tell them this. If they get 20 miles per gallon, and drive a prospective buyer around for 400 miles before they buy, you have used $80 worth of gas (rounding up to $4 per gallon). The commission on that sale will be somewhere around $6000 on average. Not so bad when you look at it that way. I’m going to echo what you and others have said – the only way that “green” technology will succeed in the long run is if it is cost-effective, saves money and is thus what people will prefer to use. Not sure if I would be brave enough to use your electric vehicle on my daily commute through west London, as it’s a regular carmageddon out there – but if it was bigger, heavier and more armoured (and still economical!) I’d consider it. That was one of the reasons I bought the Bronco 8 years ago. 11 years ago I survived a drunk driver rear ending me at 3 am while I was stopped at a red light. He was traveling 60-80 mph and never hit his brakes. The heavy duty rollbar also prevented me from being crushed. I was taken Code 3 to the hospital taped to a backboard and then walked home after being given a clean bill of health 3 hours later–hence my Bronco. I used to ride a bicycle a few miles to work each day. I did not take roads. It was about 10 miles round trip. Did it for years, because I enjoy riding a bicycle. Mostly in parks and trails now, never on the road anymore. Too many ignorant inattentive drivers on the roads nowadays. The problem is the odd accidental occurrence will eventually befall you. No one can be alert for everything all the time. It only takes one. I value my healthy life and the lives of my family, much more than I do anything else. The only thing that appears missing is the rack for the golf clubs. REPLY: No it is not missing, I don’t play golf. Good for you Anthony. Saving a buck is saving a buck. My wife and I have a Honda Insight. Over 40,000 miles we have averaged 59.5mpg. For both of us it is our first choice ride. Because we live out a dirt road that sometimes gets snow we also have a Toyota Tacoma 4WD (4 cylinder). It also comes in handy to collect wood we use to heat in the winter. We looked into various electric vehicles, but to find one (other than the Tesla) that could handle the 1,800’, 10 mile climb from town is daunting. It will be nice when/if batteries improve somewhat. I am retired, so it is relatively easy for me to avoid driving as much as possible. If I still worked I would be living closer to town. The constant drumbeat of stories about Armageddon has likely done more harm than good for the environmental movement. It is much easier to motivate people by telling them a valuable truth, rather than trying to scare them with absurd fantasies. I ride my bike to work and get excellent gas mileage – though I hear that exercise causes a lot of “dangerous” greenhouse gas emissions. Or how about us anti-AGW people who just value economics? I drive a 22-year-old Mercedes diesel (champagne tastes, beer budget) – it is all steel and leather (M-B doesn’t use much plastic!) so it is all recyclable or biodegradable when it has passed the 1,000,000 mile mark so it is much more Earth-friendly than trying to scrap a Prius with all its batteries! I am also comfortably wrapped in a very strong steel cage in the event of misadventure. And, yes I also have a bike and hiking boots. Enjoy your electric toy! Watts revolts! BTW, how much did you pay for it? How much time have you put into it? (What is your time worth–at least 25/hour). How many miles do you expect to go a year? Looking forward to your revised cost per mile figures. Probably just as well. It leads to global cursing. Weather you take it up or not, be advised that it leads to ‘fore’ casting from reality diverging from the model swing…or is that a SWAG? Another thought. As I watch Detroit kick the puck out of Dallas (4-2 in the 3rd) perhaps your little electric chair has possibilities as a ZAMBONI. A Zippy Aerosol Minimizing Bio Oxygen Neutral Infuser. A machine like that could smooth the ice and put any curve desired in a climate hockey stick for a mere pittance of eco-Watts. My Ford Explorer bumper sticker reads “powered by hydrogen-loaded nanorods”. Unfortunately, most people have forgotten about the hydrogen economy and fuel cells. I’ve a friend that lives south of Atlanta in Peachtree City. Before I ever went to visit and witness it for myself, he had told me it was likely to be behind a golf cart at the McDonalds drive-thru and see them parked in the grocery parking lot…picking up the kids at school. It would be nice if my community would try to even accommodate a stinkin’ bicycle. They don’t, won’t and it’s dangerous as heck to try and go anywhere outside the neighborhood on one. Hey Aviator, “Watts Revolt” would make a good bumper sticker for Anthony. It’s a good idea for now. But if everyone had electric cars, then electricity would be a lot more expensive. The long term solution is better technology, more nuclear power, and a willingness to actually use our natural resources. Well, all I have to say is that, I am not a “credited” Climate Scientist, but after the last 4 years of “my humble research” on this complicated issue, “I do not agree with the Gore/ IPCC/ McCain/ Enviromentalist Greenies” solutions to what is (non) AGW problem. “It is my believe that humans”, do not have a “Nat’s A-s effect on Global Climate change”. Man should not promote action’s that have an “unreasonable impact” on “Earth’s enviornment, but enough of this ‘Greenee” BS. Someone, please “prove to the the world” that, it is the “Sun” not “humans”, that “Rules”. As a result of my belief’s, I just went out and bought a “New Chev. 4×4 Truck”. (Down sized from an 8.1 to a 5.3) as my contribution. “Please end this Madness”, before this Country’s “way of life” is “destroyed by Socialisim”. As much as I hate to do it, “I’m holding my nose” and voting for McCain. Not the best of ‘all possibly solutions’, but better than the alternatives. I also pray alot!!!! but, 3.85 $ for a gallon is CHEAP!!!!.. My only complaint is that gas taxes are used to pay for the roads. If you aren’t buying gas, you aren’t helping to fund the roads that you are using. REPLY: Alright, fine. I’ll get an electric airplane. Thanks, Anthony. You’ve shown what I’ve been thinking for some time. The “solution” to gas prices is available right now — existing electric cars — and no basic tech advances necessary. Of course, some infrastructure additions are needed. “Public”, metered electric outlets situated in accessible places — relatively simple. Eventual problem, tho, is a biggie. Millions of electric vehicles will require more electric generation for recharging, and it’s darn near impossible right now (NIMBYS) to build anything other than small, cheap natural-gas-powered turbines. REPLY: The charging problem is only a problem from noon to 6PM, during peak demand hours. There is scads of excess capacity at night, and many power plants throttle back. Charging these vehicles overnight can make use of that excess capacity. My father-in-law, an old diehard Nascar fan, has always said that FORD stands for “First On Race Day”. My Benz (200c 4 cyl.) is 5 years old – and has lots of plastic. They don’t make ’em like they used to. Electric: It’s watts for driving. The electric cars are coming & in a big way from all the auto makers. They are now pouring billions into them. Why ? They want to get around the CAFE standards is one reason. As one exec said, to meet CAFE, emissions & safety standards there will have to be a ‘chemical refinery under the hood’. So far, they have gotten the prices down on all future cars to ‘only’ $11,500 extra above the ‘normal’ price of the car. So, my 2000 Sephia, instead of $14k would be $25.5k. The state of California is looking into charging a ‘mileage tax’ to make up for the losses in gasoline taxes. Makes me thing about this whole “ZEV” thing. I remember being surprised to read that back in the 1980’s electric cars were found to outgas the same amount of lead vapors as a car burning leaded gas. I guess battery tech has improved a bit with the sealed batteries, but even if they’re considered to be “sealed,” they can still vent, esp. if they’re charged too quickly. A wee bit of lead comes along with any hydrogen that’s vented. Even AGM or gel lead-acid batteries need good ventilation to prevent hydrogen gas build-up. My money saving item is a push mower for my yard. I mean a rotary blade no engine type. The input is biofuel. i.e. what I ate the night before. There is little exhaust except my hard breathing when getting out of breath. Renting a car is actually convenient as I don’t need to wash, maintain and clean it. And it certainly prevent unnecessary use. I do realize however that you need a significant interest in environment stewardship to do without the car, but it works. Wow. So they just plain don’t want people to drive, regardless of whether they’re polluting or not. Idiots. Anthony, I know AGW and policy isn’t your thing, but you and other readers may find this interesting: Lower fuel efficiency may be an unintended consequence of higher gas prices. Anthony do you have a source for that info? This would definitely be a good one to demonstrate the hypocrisy of the warmers. They don’t seem to be interested in setting good examples. REPLY: Look at the links in the post. I have his home address from his 2007 testimony before congress, and then there’s the link to Google Maps showing the actual commute. So yes, I have a source right there in the posting. Hopefully something at this conference will pan-out. Then those of us, that have serious snow-shovel experience, will be able to join in the electric car fun. Brilliant – it isn’t about AGW, just like energy saver lights, it’s about money. Has the added advantage of not using a commodity too valuable to burn, whatever the type of combustion. Plastics will be hard to replace without going back to heavier materials. The next step should be filling stations providing pallets of batteries to exchange those near discharge – a slot out/in system. Of course there is also the prospect of cutting off revenues to inimical states. (1) There is currently a large discrepancy between the cost of liquid fuels specifically devoted to transportation (e.g., gasoline and diesel) and the cost of fuels devoted to powering the grid. As you point out, even considering replacing your battery every 4 years or so, it still works out to 6-8 cents/mi. I have no idea what a gas-powered golf cart gets in terms of MPG, but assuming gas is $4/gal, it would have to get between 50 and 75 MPG. My guess is you’re in the ballpark right now. However, as battery technology improves while gas gets more expensive, I’d say the advantage is in your favor. As I am wont to say (over and over), it’s a question of spending money now or spending even more money later. (2) There are several grid technologies that are very close to competitive with fossil fuels, especially when all the externalities are considered. And more are likely in the near future. The problem is, they don’t match well with current policy. In most cases, changing the policy could be done at little to no cost overall. The hard part is convincing all the players that it’s in their best interests to change the policy. After all, if the way utilities make money on the basis of the amount of energy they provide (which is the way things are set up in most places), it stands to reason that they are not going to be very interested in promoting energy efficiency. However, if they can make money on the basis of how much energy they save, it likewise stands to reason that they will promote efficiency. Similarly, in order for intermittent, load-following, and distributed sources of energy to become real players in the energy equation, it stands to reason that smart grid technology has to become available. But that won’t happen unless the cost burden of providing it is shifted away from the utilities. Sure, the end result would be better, more energy efficient and more cost-efficient for everyone. But until the policy changes, what’s the incentive? That is a golf cart. I know because I played golf once. REPLY: Looks don’t equate. Actually there are a lot of differences. For example it has a regenerative braking system. It also has double the range of a golf cart. It has street wheels and tires, Mcpherson struts, a magnesium alloy roll cage. Safety glass, seat belts. Joe S (23:35:31) – That was the idea! I like the idea of the “solar during the peak hours” concept and I have a south facing barn roof and 300 sunny days a year that would make a good bit of power to run my air conditioning (and, like you, I also have a deep well with a full horsepower pump to run). My average electric bill last year was $110 per month. I need the price of solar photovoltaics to come down quite a bit before I’m willing to cover the barn with solar panels even with gummint rebates. bumpersticker “Take that Saudi Arabia”. I’m being facetious on some of these, of course. All in good fun. As an accountant, cost-benefit governs my decisions. If an electric car were feasible for me, I’d already be driving one; but everyone’s situation is different, and that’s the beauty of choice in the free market. REPLY: Hey, don’t knock it, Evel Knievel drove an electric car before he died. Benefits: We offer a comprehensive benefit plan including full medical and dental coverage, a 401K plan, 3 weeks paid vacation, and free recharges for your electric car while you work. I’m from Québec, Canada and here with the snow and the cold it’s almost impossible to use these small electric cars. But still we see a lot of Smart cars around here. But did someone ever realize that if big oil companies see their gaz sales going down, they will, like any other companies, raise the price of their products to gain the same profits years after years… ! If the demand goes down, price will go down. Or not go up as fast as it would have otherwise. The good old supply-and-demand curve. I am all in favor of whatever option is cheapest. I strongly prefer that the gummint does not interfere. Not that it hasn’t already. As it is the gvt. pulls in around five times as much on a gallon of gas as Big Oil makes. Whenever i point out that oil companies make around a 10% profit, no one wants to believes me. It’s true, though. Stickin’ It To The Mann! My Other Car Is A…. Car! When my wife rides shotgun! Good idea. I have considered buying an old harley and convert it to electric. Then I could put all my tools in a trailer, tow it to the job sight the first day and ride the bike the rest of the time. But it would be my luck, I would ride up to the sight and my trailer would be gone. I still may convert a harley to electric. My primary transportation has been motorcycles for the last 30 years!! My car is literally rusting away!! I supplement with my bicycles and public transportation. As you say, it is CHEAPER!!! AGW is a bad joke. I’ve been keeping an eye on alternative energy motorcycles, but, too limited or expensive so far. Anthony, I bought the “Ford Think” from the folks that won it from the local radio contest….just yesterday. I’m looking forward to fun new adventures but am having doubts about the mileage it will get per charge. Hoping I didn’t get screwed. So far it hasn’t gone very far on a couple of quick charges, but havn’t tried it yet on a full overnight charge…we shall see. Do you have any suggestions where I would go to get the batteries modified or updated? REPLY: Batteries plus on lower Skyway can provide new gel-cells. I drove it from my office on north Cohasset near the airport, to downtown, to KPAY, and back to my office on north Cohasset on a single charge. The key to battery life is to constantly charge it. Deep cycling the batteries will create lead sulfate in the battery plates much faster. Always plug it in when you can, even if you’ve only used it a little bit. Hope that helps put it in perspective: He lives during the week in a tiny apartment that he walks to work from, he takes the stairs up to his office, takes the train when he has to go down to D.C. for a meeting, and commutes out to his farmhouse that you mentioned at most once a week. Congratulations on your electric vehicle! How does your automobile insurance company feel about this rig? Any restrictions? What is the annual rate? (if it isn’t too personal). REPLY: It costs $180 per year, not too bad. I support the use of rechargeable electric vehicles, especially for urban use. I would, however, like to know more about their full-life-cycle energy efficiency, operating and capital cost. My objective is not to reduce atmospheric CO2 – since the science of catastrophic humanmade global warming is fatally flawed. We have now experienced a ~900% increase in humammade CO2 emissions since 1940, and the latest data shows there has been no net global warming since that time. My primary objective is greater energy independence for our next-door neighbour, the USA. Some good ideas have been discussed here – following is an email I sent two months ago which covers similar points. Re: Robert Bryce’s idea of a “superbattery”. when the fuel is consumed. Hence the foolishness of such technology, and the need for huge subsidies. Also there is the water consumption issue. even a superbattery, will save wind power from being a total boondoggle. gas-fired plants are most flexible for providing peaking power. non-peak periods, this would significantly level-out electricity demand. there is always room for continued technological improvement. benefits and cause significant societal and environmental damage. Sincerely, I’d like to thank you for providing this site as well as all of your hard work. I just downsized and bought a “small car” myself! (It isn’t electric). REPLY: VERY nice! If they had that Cobra setup for electric I’d buy it in a heartbeat! Heh, Heh……..Really, you’re doing a great job. Please keep it up. It’s an analysis of the impacts accrued if the US were to convert to obtaining 20% of its electrical energy from wind. While what you say about wind requiring backup is true, that doesn’t make it a boondoggle. They go into great length about how wind energy can be integrated into the existing energy portfolio in a way that optimizes the advantages and minimizes the disadvantages of both. * Support roughly 500,000 additional jobs in the U.S. Couple wind with a load-following technology like solar thermal (with heat storage) and the need for “conventional backup” as you call it would be reduced considerably. And I think you’re similarly right and wrong about nuclear too. In other words, though a nuclear plant cannot be turned on and off as load requirements fluctuate, that’s not how they are generally used in the whole energy portfolio. They are intended to supply base load power, while other sources supply dispatchable power. That DOE study I cited indicates that the average “capacity factor” (the ratio of power actually produced/total capacity) of nuclear power plants is 75%. And if the DOE doesn’t know that, who does? As for your take on batteries, I pretty much agree. However, I’d like to add that the role of vehicle batteries in leveling out grid load would be significantly enhanced by “smart grid” technology. On a smart grid they could not only be recharged at night, but function as an energy storage mechanism. IMO, if we let it happen (and our congresscritters let it happen) the future could be very bright. We can significantly wean ourselves off fossil fuels, reduce our trade deficit, increase our energy security (and decrease the possibility of a resource conflict in the process), create jobs, improve our environment (burning fossil fuels has deleterious effects besides CO2), and do all that at little or no cost in the long run. But it will require an investment in the short run — not to mention a significant change in the current energy regulatory and deployment structure. I’m sure some people are going to squawk really loud about that. But as that DOE study I cited indicates, significant federal investment and significant government intervention the regulatory and deployment structures in our nation’s energy backbone have happened before. They happened in the 40s and 50s when we went on a binge of building large hydropower plants, and again in the 70s when we went on a binge of building nuclear power plants. And I’m sure there were many critics back then, too. E.ON Netz in 2005 produced its informative Wind Power Report, which clearly outlined the shortcomings of wind power. At that time E.ON was the largest wind power generator in the world – and may still be. I think E.ON has very significant credibility when they openly discuss the main disadvantages of their very large wind power portfolio. 2. Wind power output varies approximately as the cube power of the wind speed, so wind power causes huge, short-term fluctuations in power supplied to the grid, and can cause serious grid instability. This report demonstrates the key flaw that is ignored in many analyses of wind power – wind does not blow enough when you need it, so wind power is ineffective at replacing conventional power stations, and the problem worsens as more wind power is added to the grid. P.S. Re nuclear plants supplying base load power – that works if there is not too much nuclear capacity as a total percentage of grid generating capacity – but look at Ontario and France, where nuclear predominates. The situation I described (underutilized overnight generating capacity) becomes much more significant as you add more and more nuclear power to the grid. E.ON states that in 2004 Germany had an installed wind power of 15369MW and an average feed-in of 2968MW or 19.3% Capacity Factor. In 2004 E.ON operated over 40% of the wind power in Germany (more than the entire installed USA wind capacity), so one assumes their numbers must be representative for their grid size, layout, wind speed, etc. E.ON calls this factor Substitution Capacity (the US EIA calls it Capacity Credit) – Germany is now at 8% Substitution Capacity, which is low, but will decline to 4% by 2020 if all goes according to plan. In summary, an analysis by a German industry leader, which operates more wind power than the entire USA, says it must install 12 to 24 times more wind power capacity than the conventional power that the wind power replaces. “Guaranteed wind power capacity below ten percent – traditional power stations essential. the secure production capacity of the system, by providing 8% of its installed capacity. Guaranteed wind power capacity below ten percent – traditional power stations essential. The more wind power capacity is in the grid, the lower the percentage of traditional generation it can replace. Whilst wind power feed-in at 9.15am on Christmas Eve reached its maximum for the year at 6,024MW, it fell to below 2,000MW within only 10 hours, a difference of over 4,000MW. This corresponds to the capacity of 8 x 500MW coal fired power station blocks. 1.The highest wind power feed-in in the E.ON grid was just above 6,000MW for a brief period, or put another way the feed-in was around 85% of the installed wind power capacity at the time. 2.The average feed-in over the year was 1,295MW, around one fifth of the average installed wind power capacity over the year. 3. Over half of the year, the wind power feed-in was less than 14% of the average installed wind power capacity over the year. The feed-in capacity can change frequently within a few hours. This is shown in FIGURE 6, which reproduces the course of wind power feed-in during the Christmas week from 20 to 26 December 2004. Whilst wind power feed-in at 9.15am on Christmas Eve reached its maximum for the year at 6,024MW, it fell to below 2,000MW within only 10 hours, a difference of over 4,000MW. This corresponds to the capacity of 8 x 500MW coal fired power station blocks. On Boxing Day, wind power feed-in in the E.ON grid fell to below 40MW. Handling such significant differences in feed-in levels poses a major challenge to grid operators. And it is one that was addressed in the DOE study I cited in a previous comment as well: wind power cannot be optimized without a robust, widely integrated high voltage grid. Pingback: I Think, therefore I drive « Watts Up With That? I’m about to purchase a 2002 Ford Think! also. Please everyone pray that the deal goes through. I’ve been wanting one for a long time. Oh, and by the way, It is not cheaper to ride a bike. Riding a bike burns calories. Burning more calories means eating more food. Food is EXPENSIVE! Well CRAP ! it was a scam ! The Ford Th!nk I wanted to buy, listed on Craig’s List, is a scam. I did some research and found the EXACT same reply letters on an online Scam Forum. I was wondering why the guy wasn’t directly answering my questions. REPLY: try Ebay, that is where I bought mine. HELP!!!! Can you help me find where to buy one and how much they typically go for…. thanks! is the Ford Think for sale? If so, how much and where is it? REPLY: Try Ebay, that is where I got this one. REPLY: I use Allstate, they have it in the database already. You could do with a less powerful engine and a cheaper battery pack. Maybe you could find an unfinished kit on e-bay and you perform the electric conversion yourself if you can find the time. There is also a British kit car producer that offers an electric version of the Cobra. I have to look for the link and send it to you as soon as I have found it again.